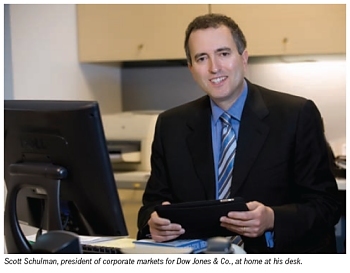 FEATURE: Schulman: The View From Dow Jones & Co.
Schulman: The View From Dow Jones & Co. This month, Scott Schulman is celebrating his first year as president of corporate markets at Dow Jones & Co. But he’s far from being a newcomer to the company. He first crossed the threshold at Dow Jones in 1999, when he became vice president of strategic planning and development, and it turned out to be a good match. So good, in fact, that he soon added responsibilities for Dow Jones Interactive Publishing. Two years later, he was promoted to president of Dow Jones Consumer Electronic Publishing, where he developed a liking for internet businesses that served the enterprise and consumer markets. By 2006, he rounded out his skills set as chief strategy officer at Dow Jones and senior vice president of global sales and marketing of The Wall Street Journal franchise. Over the past several years, he led the Dow Jones Financial Information Services businesses, focused on specialized business information. Today, he has a rather commanding view of the Dow Jones & Co. landscape. After nearly 12 years in his many leadership positions, Schulman has firsthand knowledge of each of the key markets that he now oversees. As president of Dow Jones corporate markets, which includes Factiva, Schulman’s domain comprises all the business information services that the company sells to outside enterprises. “Dow Jones reorganized at the beginning of the calendar year  into four broad business areas: print, consumer digital, financial markets and newswires, and corporate markets/professional, which is all the business information products,” he says. While his job is to focus on big products such as Factiva in the enterprise, there are other corporate-focused products in specialized vertical sectors, including risk and compliance, PR and corporate communications, energy and commodities, and enterprise solutions, which include other offerings broadly focused on the corporate customer. Despite the industry challenges of information overload, emerging mobile devices, and a troubled economy, Dow Jones has been true to its corporate mission of providing the highest quality news and information to help businesspeople and consumers make good business decisions. In the corporate market, Dow Jones provides news, information, and insight that helps businesspeople and companies make some of their most important decisions, manage risks, generate revenues, and lower costs, he says, adding that News Corp. has always been a great influence on that mission because of its global thinking, aggressiveness, and belief in the power of quality information and aggregation. “A big part of our value proposition in the corporate market is about aggregating content and News Corp., whether it’s through satellite television or sites like Hulu, recognizing that aggregating content is a big part of its role as a global information company,” says Schulman. Information professionals and librarians are—and have been—important customers and partners. “We want to help the research professionals demonstrate the value that businesses like ours bring to the enterprise,” he says. Products such as Dow Jones Consultant are using the power of the Factiva platform and making it as relevant as possible to people in the enterprise. Before he joined Dow Jones, Schulman had been a partner and research analyst in a top consulting firm in New York City, so he has experience as a Factiva customer. He knows the market and its pain points well. Dow Jones Consultant lets consultants get a quick read on what’s going on with their key clients and prospects to generate insight and thought leadership powered by thousands of Factiva sources. Schulman says he has been impressed with how clearly librarians express the depth and breadth of their roles, especially at the Special Libraries Association (SLA) annual conference he attended last June in New Orleans. “The research librarians are very innovative in how they help their companies cut through all the noise and information overload,” he says. “They can find cost-effective ways in these days of budget trimming to manage the social media, focus on the issues, and find new ways of getting information to users.” And although there’s plenty of free content on the web, the value of professional aggregation, analysis, and filtering are more important than ever before. And what about competitors? Schulman says there are a few, but Dow Jones doesn’t see the web as one of them. “A service like Factiva has thousands and thousands of resources that you can’t get on the free web anyway,” says Schulman. “Our clients get that. They understand the value that a service like ours has.” And at the end of the day, he sees the value in having the best content in most of the regions around the globe. “We have the breadth of Dow Jones and The Wall Street Journal [WSJ] content that we continue to enrich in Factiva,” he says. Plus, the WSJ keeps adding more journalists and more sections that not only make our offerings stronger, but it also improves our content.” Tools such as automatic translation and newsletter distribution in the enterprise have set Dow Jones as the clear leader in the marketplace. “We feel very confident that companies that try to rely on the free web are beginning to recognize the power of a professional service,” he says. In the new branding campaign for Factiva, the big message is that users can surf the web and waste time, or they can rely on a service that’s in the business of helping executives and their teams find the best sources, put them into a usable format, and discover insight from content to make sound decisions and help enterprises run smoothly. Going forward, Schulman is busy working on short- and long-term strategies for the business. He’s concentrating on creating enhancements in the tools and products in four key areas that will keep the company in step with the evolving marketplace and in meeting the needs of the users. “We’re pursuing significant investment and improvement in our core search, metadata, user experience, and content,” he says.